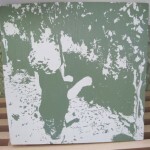 I won a blog contest for a customized canvas art piece created by Modern Bird Studios. I cannot tell you how excited I was when I found out. 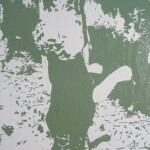 I had been admiring their gallery for sometime and the thought of having one of my personal photographs transformed into a unique, urban masterpiece made my heart race! Modern Bird Studios is owned by Gregg and Megan Deal. I have gotten to know Megan from our previous interview and all of her hilarious tweets. Gregg is the artist and he pours his heart into these amazing creations! He transforms photographs into original studio pieces created with a combination of digital, hand, and painting processes. The results are truly amazing. 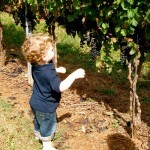 My original thought was to use a picture of my son trying to pick grapes at Barboursville Vineyards in Virginia. Being the over-analyzing freak that I am, I began second guessing my choice. I spent hours looking through photographs until I finally just went with my original photo idea. The real challenge was deciding on colors, that was tough since I had no idea how it would turn out. You know you want one! Modern Bird Studios is offering my readers a 15% discount on orders placed within the next 7 days, all you need to do is use code UNEMPLOYEDMOM at checkout! What are you waiting for? Once your order is placed, come back and leave a comment telling me about the photo you selected.